First of all, thank you very much for this wonderful piece of software ! I found an unexpected behavior when changing the output directory in the Queue tab. 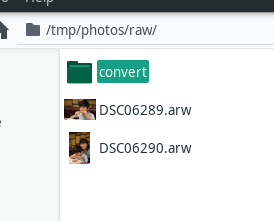 Then checking the tooltip on the output directory I realized that I could ask Rawtherapee to automatically put my output JPG directly in the correct directory one level higher with the %p2 variable. The problem was that I did not pay attention and just used %p2 without %f. In this case no error message is displayed and pictures end up in %p2/converted folder. Now I changed to %p2/%f and pictures end up in the correct folder without the added “converted”. I hope I’m clear enough. Set the queue template to %p2/%f and the file gets saved to /tmp/photos/pippi.jpg, all good. Though it may seem odd, it is consistent. The filename used while exporting does not need to resemble the filename of the input image. the behavior you explain is indeed odd, but is not exactly the issue I faced. @floessie will you commit this fix, or should I? You can. I’m busy ATM. Thanks! 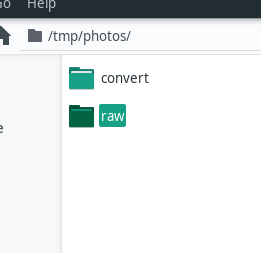 I can’t reproduce @Pietro_Dolcini’s issue where /tmp/photos/convert/ is magically created when using template %p2, so I noticed no difference with the patch on my end. Patch committed to dev. @Pietro_Dolcini if you compile yourself, then you can help verify that it’s fixed. The commit is 5.5-283-g977af213b, branch dev. Now compiling, I’ll let you know the result this evening. Now with the previous sequence I get as a result two pictures calles photos.jpg and photos-1.jpg. In Rawtherapy interface the place where I should write %p2/%f is called “output directory” not “output file names” or maybe simply “output name” which makes it a little surprising that changes the name of the files. Maybe changing the name would avoid other users to make the same mistake as me. Thank you very much to take the time to make the correction. Maybe changing the name would avoid other users to make the same mistake as me. Agreed, and there were some other issues.